HONOLULU, Hawaii, May 9, 2018 (ENS) – The continued eruption of Kilauea Volcano and earthquakes on the Big Island of Hawaii have prompted Governor David Ige to sign a formal Presidential Disaster Declaration request, asking the president to release funds to help the state cope with the crisis. The eruptions of fiery lava are coming through at least 15 fissures, many in populated areas such as Leilani Estates, and nearly 2,000 people have been ordered to evacuate. Some 36 structures, most of them homes, have been burned down. “Federal assistance would be necessary to enable us to successfully conduct such large-scale operations,” the governor said. Since May 3, when the governor issued an emergency proclamation for Hawaii County authorizing the expenditure of state funds Hawaii County and the State of Hawaii have dedicated more than $400,000 in emergency protective measures for the lava flow and earthquakes in the Kilauea East Rift Zone. The governor has directed the execution of the State of Hawaii Emergency Operations plan to provide for the quick and efficient relief of damages, losses and suffering due to the volcanic eruption and seismic activity. The estimated cost to protect residents over the next 30 days is expected to exceed $2.9 million, Governor Ige’s Office said in a statement. These costs do not include permanent work or damages incurred from the earthquakes, and costs are expected to skyrocket should large-scale air and sea evacuations become necessary. 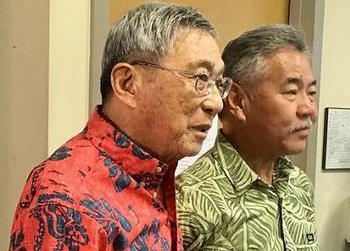 Governor Ige is asking that the declaration authorize the Public Assistance Grant Program for Hawaii County, as well as the Hazard Mitigation Grant Program statewide. Geologists with the Hawaiian Volcano Observatory are warning that explosive eruptions at Kilauea’s summit are possible. Typically “very little warning” of steam-driven explosions at volcanoes, they said. If there is an explosive eruption, islanders in the area can expect ballistic projectiles and ashfall. “During steam-driven explosions, ballistic blocks up to two yards across could be thrown in all directions to a distance of 0.6 miles or more. These blocks could weigh a few pounds to several tons. 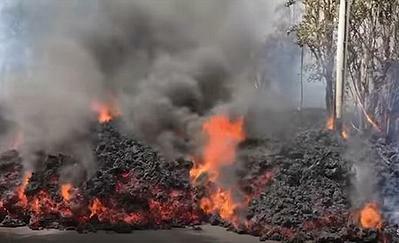 Smaller rocks could be sent several miles from Halemaumau, mostly in a downwind direction,” the scientists said. Meanwhile, the geothermal energy conversion plant in the area, Puna Geothermal Venture, PGV, is expediting the removal of hazardous materials it owns offsite and away from the volcanic eruptions at the order of Hawaii County Mayor Harry Kim. Pentane gas can harm people if it is inhaled or absorbed through the skin, and it burns the eyes and nose. Exposure can cause dizziness, lightheadedness and passing out, and the build-up of fluid in the lungs. “State and county teams will work closely to marshal the necessary resources to fully engage and ensure a successful effort to secure PGV’s facilities and protect public health, safety and the environment,” said Governor Ige. 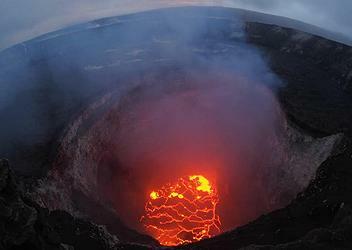 Kīlauea ranks among the world’s most active volcanoes and may even top the list, says the U.S. Geological Survey. The summit crater has an active lava pond and leaks toxic gases. The caldera was active nearly all during the 19th century and the early part of the 20th century. Since 1952 there have been 34 eruptions, and since January 1983 eruptive activity has been continuous along the East Rift Zone. In March 2008, a vent opened in Halemaumau Crater at the volcano’s summit.